Dining options at the hotel include a restaurant and a coffee shop/café. A bar/lounge is on site where guests can unwind with a drink. Wireless Internet access is complimentary. Event facilities measuring 3368 square feet (313 square metres) include conference rooms. This business-friendly hotel also offers a fitness centre, a terrace and a garden. Limited on-site parking is offered on a first-come, first-served basis (surcharge), and a car charging station is available. Novotel Ipswich is a smoke-free property. 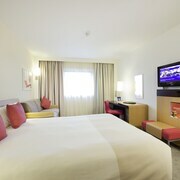 Situated in Ipswich, this hotel is within a 10-minute walk of St Peter's by the Waterfront and Ipswich Waterfront. Chantry Park is 1.8 mi (3 km) away. Ipswich Station is 9 minutes by foot and Derby Road Station is 29 minutes. This smoke-free hotel features a restaurant, a fitness centre and a bar/lounge. WiFi in public areas is free. Other amenities include a coffee shop/café, 24-hour room service and conference space. All 101 rooms provide conveniences such as sofa beds and coffee makers, plus complimentary wireless Internet access and LCD TVs with cable channels. 24-hour room service, minibars and hairdryers are among the other amenities available to guests. This property is undergoing renovations from 10 October 2018 until 20 June 2019 (completion date subject to change). 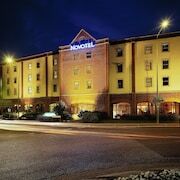 Novotel Ipswich offers 101 forms of accommodation with minibars and a safe. This accommodation is furnished with double sofa beds. LCD televisions come with cable channels. Bathrooms include a combined bath/shower unit and a hairdryer. Guests can surf the web using complimentary wireless Internet access. Business-friendly amenities include desks and telephones. Additionally, rooms include coffee/tea makers and an iron/ironing board. Housekeeping is provided on a daily basis. 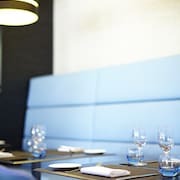 Elements Restaurant – This restaurant specialises in international cuisine and serves breakfast, lunch, dinner and light fare. Main Bar – This bar only serves light fare. Pets are allowed for an extra charge of GBP 7.50 per pet, per night.